Double-hung window are versatile, easy to clean and ideal for replacement. Home Solutions Midwest installs strong, low-maintenance double-hung replacement windows from Renewal by Andersen. You have many options when it comes to choosing the right replacement windows for your home. Our team of professionals is dedicated to helping you choose and install the very best products. 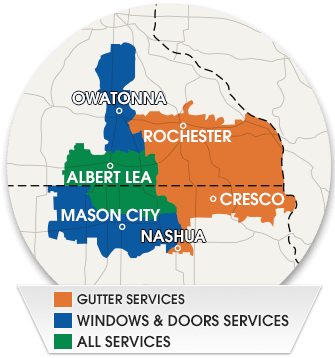 We are the experts for window replacement in Owatonna, Winona, Faribault, Austin, Northfield, Albert Lea, Farmington and nearby. Looking for an estimate? Call us at 1-844-665-0388 to schedule your free in-home design consultation today. Double-hung windows are the most popular window choice among homeowners. As a go-to replacement window company in Albert Lea, can help you decide whether these classic windows are the best option for you. Double-hung windows are designed with two sashes in a single frame, allowing the window to slide up and down and give you a custom level of ventilation. They are especially popular to install near decks and patios. They are affordable and easily replaceable, making them ideal for homeowners who want to upgrade their windows on a budget. Easy cleaning and easy operation can make life simpler for busy families. These windows are fully compatible with screens and window air conditioning units, making them a very comfortable choice in summer. Double-hung windows can easily be insulated and weatherstripped for maximum energy efficiency all year round. We can install Renewal by Andersen double-hung windows in virtually any color and size. When you choose to work with Home Solutions Midwest for your double-hung window needs, you’re putting your home in good hands. We have been selling and installing high-quality windows since 1979. We stand out among replacement window companies in Rochester for our trustworthy reputation and our excellent customer service. Our team of experts is ready to consult with you and find the best window solutions for your individual situation. For more information about double-hung windows, get in touch with us today. We offer free, no-obligation consultations and cost estimates in Winona, Owatonna, Austin, Faribault, Farmington, Northfield, Albert Lea, Rochester, Northfield, Mason City, and the surrounding area.